MOLD. Will I Know It If I See It? About the author. 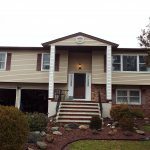 Frank J. Delle Donne is a NJ Licensed Home Inspector. He is the owner and Senior Inspector at Regal Home Inspections, LLC. Frank has been a volunteer Emergency Medical Technician for over 20 years and is a past member of the Colts Neck, NJ Board of Health and was Chairman of that Board for 2008 and 2009. 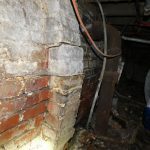 During my studies to become a Home Inspector I learned a great deal about MOLD and felt compelled to share that information in a manner that is easy to understand and increases awareness. If you are in doubt, TEST to be sure. What is mold? Mold is a fungus. A mushroom is a fungi and is mold. There are a number of important things to know and understand about mold. I have emphasized understand because as much as you may not want to accept these facts they can’t be avoided. Please commit to accepting these facts. 2) Mold is naturally occurring. 3) Mold has its purpose in the natural order of things and in the environment. 4) Mold’s basic form is in a spore. A spore is a tiny, tiny particle. A “Mold seed” so to speak. When you see the dust particles in the sun beam (as we’ve all seen) some of what you may be seeing might be a mold spore. 5) Finally, no matter how insulated your house is you can’t prevent mold from coming from the outdoors to the indoors. Imagine saying, “I am going to open the refrigerator and I will stop every bit of cold air from escaping the refrigerator while the door is open.” Impossible, right? Of course it’s impossible to stop the cold air from coming out of the refrigerator. If you said or thought, “NO” you can stop reading now. So Mold spores are everywhere. If you live in Arizona you may have different types of mold than if you lived in a rain forest but you’ll have mold, period. There are thousands and thousands of types of mold. Some are bad and some are good. Do you like Bleu Cheese dressing? Well that’s made with mold. A good mold of course. And some molds are bad. If someone has respiratory medial issues a high concentration of mold in the home may make their medical problems worse. What does mold need? Mold needs a few things to thrive. Obviously it begins with the aforementioned mold spore. If provided with enough moisture (water or very humid air) and a food source the mold will grow. The example I use and many people understand is this. Have you ever noticed that after a few days of rainy, damp and dreary weather mushrooms start to pop up in your yard? Well those mushroom mold spores were there before it started raining but now that they have plenty of water, they grow. Then notice that after a few days of sunshine the mushrooms disappear. That’s because the water/moisture source literally, dried up. Get rid of the water and we get rid of the mold. 1) A new leak in the roof lets water in where it didn’t before. 2) A basement is constantly damp or water has accumulated after a heavy rain. If the water sits around too long it could foster mold growth. 3) Water is penetrating the outside exterior siding and leaking into the wall. This can be particularly nasty because you may not be able to see it. By the time the mold colony makes an appearance inside the home the interior of the wall is completely consumed by the colony. 4) Perhaps a leak developed in a pipe under a sink or inside the wall? In these examples, all of the elements that encourage mold growth were there except for one, water. When the last piece of the mold-puzzle is added, mold can grow. Once you get rid of that moisture the mold will once again go dormant. Mold may present in a manner that is easy to see. 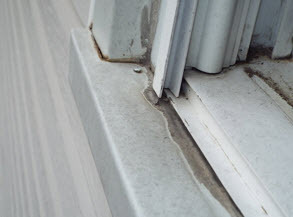 In Photo 1, notice the gap where the outside trim meets the window sill. In Photo 1 you are looking at the outside of the window. Water can easily penetrate through those gaps. And in Photo 2 you see the results of that leakage. There are vertical water stains that initially caught my eye on this inspection and there is the obvious mold along the top of the trim and it has moved into the rug. It’s a little more difficult to notice but you can see how the dry wall has been damaged by the water penetration. A mold swab was taken and sent to the lab for mold species identification. In this case, and in many cases, the paper (cellulose) of the dry wall is like a mold buffet. The dry wall paper is the food source. As mentioned above, a swab is one method of collecting a mold sample for lab analysis. Another direct contact test is a tape lift. As the same implies, a piece of adhesive back tape is placed against the suspect mold area and spores will attach to the tape. The tape (like the swab) is market with date, time, location the sample was taken, etc. and sent to the lab. If appropriate and possible, a bulk sample may be taken. An example of a bulk sample may be a small piece of wall paper that appears to have mold on it. A piece of the material can be cut and sealed in a plastic bag, marked, identified, etc. and sent to the lab. These three methods, swab, tape lift and bulk are ways to collect samples from surfaces. Often times families with members (adults or children) that have respiratory problems want to assure themselves that there aren’t active mold colonies releasing spores into the indoor air. There may be a hint of mold odor in the air. One, or more, family members may be having breathing problems that can’t be pinpointed to the cause. They may come to a point where they would like to take air samples to either rule poor indoor air quality out or identify an indoor air quality problem so it can be corrected. The process for testing indoor air for mold is an interesting process. First, please remember that mold spores exist everywhere. This can’t be denied and it can’t be corrected to 100% cleanliness in a home. It just can’t. The testing process uses small collection canisters attached to a vacuum pump. The canisters are about the size of a golf ball and air is pulled into the canister and mold spores are trapped. The canisters (note plural) are sent to a lab for analysis. Now here’s the interesting part. There will be 5 -10 air samples (canisters) taken in every home. Some homes may necessitate more samples but there shouldn’t be any less. The first sample is taken outdoors! Why you may ask? Well remember when I said that there are mold spores everywhere and that they occur naturally. We need to take a BASELINE test so we know what types of mold exist in your area NATURALLY. If mold X exists naturally where you live, don’t be shocked if mold X is inside your home! After BASELINE #1 test we’ll take additional tests inside; basement air samples, bathrooms, kitchen, etc. After we get all the inside samples we need we will take our last sample back outside for BASELINE #2. The two BASELINE samples identify the types/species of molds that naturally occur and these two test will tell us approximately in what concentration these naturally occurring mold spores exist. 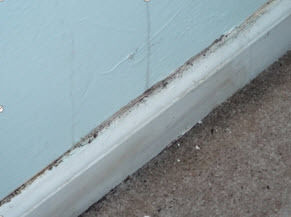 Indoor Results – If the indoor results consistently reflect the same types of mold as the baselines and indicate similar concentrations inside as exist outside, this is normal. However, if the indoor tests indicate significantly HIGHER concentrations of some types of mold, this would indicate that there is something INSIDE the house fostering mold spore growth. If the sources were not apparent, this would be a good time to consult with a mold remediation company. Aspergillus/Penicillium, Cladosporium, Ganoderma, Stachybotrys and Zygomycetes to name a few of the over 1 million mold types. You can rely on Regal Home Inspections, LLC not to find mold where it doesn’t exist because we do not perform the remediation. We take the samples and make the tests. We work with the most reputable labs that perform the sampling analysis and Regal will help you understand the results. If correction is needed, there are many mold remediation companies available and registered with New Jersey. Mold sampling does not require certification or licensure but mitigation/remediation companies are registered with the state.